A little bit like "Something old, something new, something borrowed, something blue" is de rigueur for a bride, there are a few simple rules to follow when composing a cheese platter: something sheep, something cow, something goat, something blue, something hard, something soft, something strong, something mild. 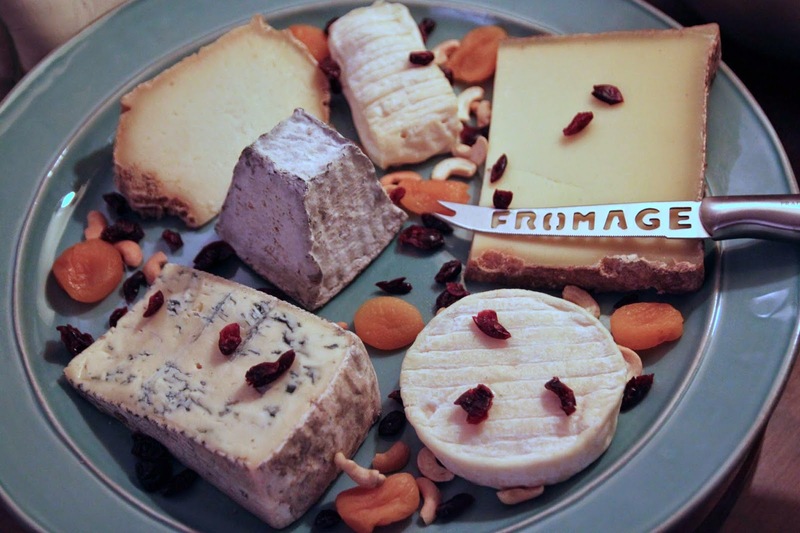 Many of these requirements can be combined, however, since the something hard could be, for example a cows' milk Comté or a Tomme de Brebis, and the something soft could easily be a fluffy cow Chaource or an oozy St. Clément. This means, in essence, that a minimal "perfect" cheese platter would have three cheeses on it, since you could do quadruple-duty with the blue (sheep, soft, strong, and blue, for example) and triple-duty with one of the others (a mild, hard, cow). For a full, luxurious choice, however, a standard is a minimum of five -- if there are enough people to warrant that many cheeses. Several of my cheese platters, especially recently, have been lacking blues, as I seem to be running out of new blues to try. That doesn't mean I can't serve the platters, or that they're not highly appreciated. It just means that, officially, they're not perfectly composed and balanced. Though Tomme des Pyrénées sounds like it would be a) a very generic name for just about any cheese from the Pyrénées and b) a sheep cheese (from the Pyrénées), it is actually c) neither. It's an AOP-status cheese made from cows' milk. Though, at least, we got the Pyrénées part correct. The version I buy is a farmhouse cheese, riddled with holes in a semi-hard texture. It's a pressed cheese, and one of 350 farmhouse versions, and a dozen artisanal and industrial producers. They produce about 2,500 metric tons of this tome each year. There are an additional 2,500 metric tons made by three larger businesses who use pasteurized milk. I might even go so far as to say it's a bit rubbery. On the positive side, that melts in the mouth. It's got a stronger flavor than "rubbery" connotes, and tastes of grasses and herbs. The crust is a bit dry and crumbly and not what most people will enjoy eating, I suspect, but at least it tastes kind of mushroomy. This Tomme des Pyrénées is part of a near-perfectly composed cheese platter. 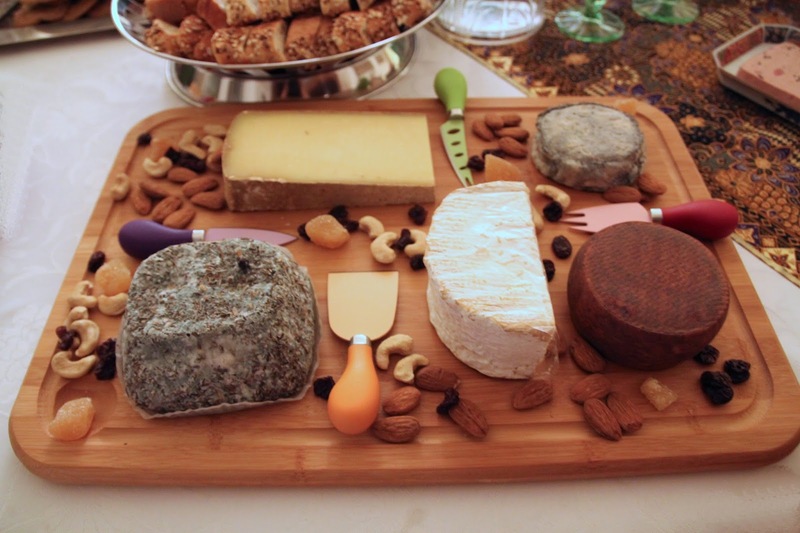 On the platter, besides the fruit, nuts, and honeys for decoration and nibbles, you can see the hard cow's cheese, a soft goat cheese, a soft cow's cheese, and a blue-ish cheese (mild, but still blue). So what's missing? Why something sheepy, of course.